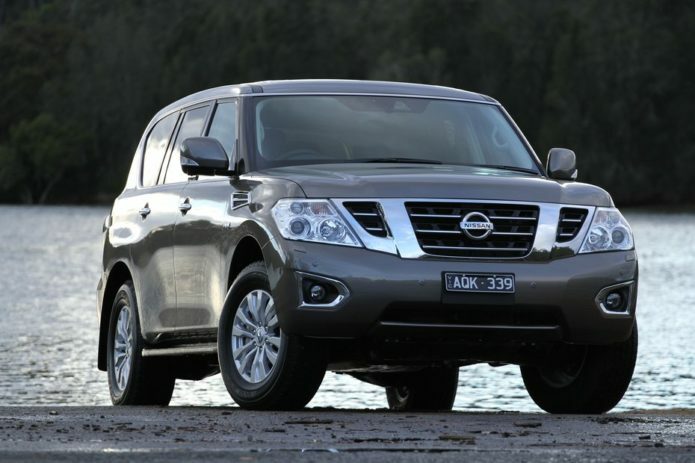 Can the new Y62 Nissan Patrol take the towing crown from the Toyota LandCruiser 200 Series? There used to be a rivalry between owners of the Nissan Patrol and Toyota LandCruiser much like there was between the Falcon and Commodore. As with the Aussie cars, things aren’t like they used to be with the big Japanese SUV wagons. The Nissan Y61 Patrol has gone, so there remains only the Y62 Patrol petrol. Many argue that a Patrol without a diesel is much like a Commodore without a big V8 engine. Meanwhile, the LandCruiser 200 Series has established itself as the towing king on the Australian market. A V8 turbo-diesel engine churning out a wad of torque and a heavy, long footprint on the road has made it the go-to wagon for towing big and heavy trailers. The 200 Series has been on the market much longer than Y62 Patrol (2007 versus 2013) but has had several upgrades since, the latest in 2015. The Y62 Patrol has a LandCruiser-matching 3500kg towing capacity and is also big and heavy with a long wheelbase (all good for towing heavy trailers). The Patrol Ti-L’s spec puts it between LandCruiser VX and Sahara grades. It’s $4791 cheaper than VX and $26,211 cheaper than Sahara. If you compare it to LandCruiser diesel models, it’s $9891 cheaper than VX and $31,311 cheaper than Sahara. The Y62 Patrol has been with us since 2013 but late last year the new MY18 Nissan Patrol arrived with a new bumper, fog lights and grille. The 18 inch alloys are also a new design. Inside, the MY18 Patrol scores a new infotainment system, two USB charging points at the rear of the centre console and for Ti-L larger eight-inch screens in the back of the front seat head rests. The mirror’s party trick is that when you flick the old-school dimming lever underneath it, the standard mirror view is replaced by a LCD monitor. I-RVM uses a narrow-angle camera at the back of the Patrol which relays vision to what Nissan claims is a specially shaped LCD monitor with a aspect ratio of approximately 4:1, versus conventional monitor’s 4:3 or 16:9. We tested the top-spec Ti-L, which is well fairly well equipped – although it’s missing some ingredients that it should have, as well get to later. Active safety features include blind spot warning and blind-spot intervention, forward collision warning, lane departure warning, lane intervention warning and tyre pressure monitoring. It also has an around view monitor (with Moving Object Detection, new for 2018), an eight-inch touch screen, satellite navigation with traffic alerts, ventilated/heated front seats, keyless entry/start and active cruise control. There are also Xenon headlights, a rear diff lock, sunroof, second-row entertainment system (two eight-inch screens, headphones and remote control for USB/DVD/HDMI). The Patrol has dual-range transmission for off-road work and an off-road monitor screen as part of the infotainment system. There’s space for seven occupants in the Ti-L’s leather-lined cabin (the cheaper, lower-spec Ti has eight seats). The Patrol has a full size (alloy) spare wheel. What is missing (and is available on most cars and SUVs half the price of the Nissan) is a digital speedo. The trip computer (in the centre of the instrument cluster) is also very basic and instead of steering wheel or column stalk controls for it, they’re on the dash binnacle. It just seems an outdated and cheap way of doing this. Speaking of out-dated features, the Patrol has a foot-operated park brake. Surely an electrically-operated park brake should be standard on a $90k SUV? The eight-inch infotainment screen is a bit clunky when operating the audio part of the system (seeking for a radio station, for example) but the satnav is easy to operate. The only not-so-good thing with the satnav was that the lady who alerts you to nearby traffic light/speed cameras included warnings for cameras on parallel roads a block away. If you wade into the nav settings you can ask for the lady to not speak of traffic such things again. But then you won’t get warnings for cameras you are about to drive past. There are very comfortable and supportive front seats in the large, wide and tall cabin, and you get plenty of leg room as well. The second row is spacious too, with enough room for three adults to sit comfortably. The split third row seating is more of a compromise, for teens and adults at least, because the seat base is very close to the floor and there’s not really much foot room under second-row seat. The cargo area is bigger than most seven-seaters with the third row seats up, and is cavernous with the back row folded. The only let down as such is that the third row backrests don’t sit entirely flat when folded. The Patrol feels big around town, especially when navigating multi-story carparks. It’s not much bigger than a 200 Series but you notice its extra girth in narrow confines. Ride is a bit abrupt over small bumps around town but smoothes out when you get out on the open road. The Patrol sits flat though corners thanks to its Hydraulic Body Motion Control suspension. Steering is not exactly razor sharp, with a need to turn the wheel a lot to make something happen. It’s light too, with not much feedback. It might not handle like a sports SUV, but put your foot down around town and the Patrol is very quick for a 2750kg SUV. If you’re going to own a V8, it should sound like one. The Patrol is very satisfying on that front. That near three-tonne mass, bluff aerodynamics and fairly tall gearing take their toll when at highway speeds. The Patrol needs to drop a gear or two at 100km/h to wake it up. Not much happens when you just squeeze the throttle. If you need a quick burst when overtaking though, sink the go pedal and the Patrol lunges forward at a satisfying rate. If you don’t work the engine hard fuel consumption is not too bad either. We averaged 11.6L/100km during easy 110km/h cruising (without a trailer). However a lot of around-town stop-start work puts a big dent in consumption figures: in such conditions, consumption rose to 24.2L/100km. At first glance, the Patrol’s towing specs look good: it has a 3500kg maximum towing capacity, of which a maximum 350kg can rest on the towball. The Patrol has a 750kg payload and so when loaded to its 3500kg maximum Gross Vehicle Mass, it’ll still be able to tow its full 3500kg capacity (so Gross Combined Mass is 7000kg). The downside is the Nissan’s 350kg maximum towball download becomes a 250kg maximum if you have loaded the Patrol to its 3500kg GVM. However, if you reduce payload in the Patrol by 70kg, (so its GVM is now 3430kg) maximum TBM is 300kg; reduce it by 100kg and TBM is 325kg. To use the maximum 350kg TBM, you’ll have to take 130kg out of the Patrol. As if towing weight legalities weren’t complicated enough already. The Patrol does not have trailer sway control as part of its stability suite. We tested two different trailers behind the Patrol: firstly a 2.75 tonne trailerboat supplied by Webb Marine in Kirrawee NSW and then a 2720kg Jayco Silverline Outback loaned to us by the guys at Jayco Sydney in St Marys NSW. The trailerboat had a 300kg towball download, and with it on the Patrol rose 17mm at the front and dropped 75mm at the rear. With 180kg of the Jayco’s coupling weighing down on it, the Patrol dropped 25mm at the back but front suspension height was unaltered from unladen. We only towed the boat a relatively short distance around town, with plenty of stop-start work. Even though we didn’t bury the right foot, fuel consumption exceeded 30L/100km. We wondered if this was a sign of things to come (with the Jayco caravan, for which we planned a 150km towing loop). Last time we tow-tested a Y62 in 2013, it had averaged 28L/100km towing a 2500kg caravan. The surprise came when towing the Jayco on a 100km/h freeway and highway loop, including a hill climb and clearing some traffic to get out of the suburbs. The average was 20.8L/100km after tank-to-tank fills. Nissan appears to have done something to the Patrol’s tuning to peg back fuel consumption. It’s unlikely you’ll ever have range anxiety with the Patrol. It’s 140-litre tank is good for 623km (with a 50km safety margin) at our towing average consumption. The Toyota LandCruiser 200 Series V8 turbo-diesel likes a drink with a big van behind it. It’ll average around 20L/100km like the Patrol, and its distillate is typically more expensive than the Patrol’s (minimum 95RON) unleaded diet. Towing performance was very good too; it tows like nothing’s there off the mark – it’s very stable. The Patrol felt is could easily go faster than posted 90km/h speed limit on our test hillclimb, but it had to kick-down and rev pretty hard to maintain that 90km/h. The Patrol did feel a bit unsettled towing the trailer boat with its 300kg towball download, but with the caravan it felt better. There was some slight yawing, and so with some vans you might want to consider fitting a weight distribution hitch. Ride quality was pretty good when towing too. The Patrol felt composed, with only small amount of front-end float. The Patrol does seem underdone with some of its controls and it is a big unit to thread around town. Yet it is a very good tow vehicle, with very good performance, pretty good stability and ride and the fuel consumption of a small V8 – if you don’t push it hard. A good LandCruiser 200 alternative? You bet.